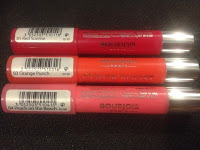 As you all know I'm always on the hunt for a good lippy, and this month I discovered a Bourjois lip balm, but not just any, no no ... it's a lipstick that comes in one of those crayon forms. 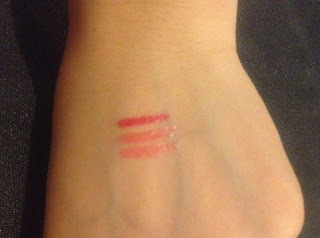 You know that a lot of brands have come out with their tinted lip balms such as Clinique's Chubby Sticks and Revlon's Just Bitten Kissable Balm Stains. Well, Bourjois has come out with their version of it. They're called the Bourjois Color Boost and they've launched 4 colors: 01 Red Sunrise, 02 Fuchsia Libre, 03 Orange Punch and 04 Peach on the Beach. Red Sunrise is a watermelon color which is a pinkish red. Perfect for those who are afraid of using a bright red on their lips. This is a great color to start your way to a red lipstick. Fuchsia Libre is a cool toned pink. I don't think this color would suit me since I have a yellow undertone, but I'm sure this color would suit those with a more pinkish undertone. Orange Punch is a color that appeals to me. Don't let the name fool you, it's not a true orange lipstick, it's more of a peachy pink color. And then we have Peach on the Beach, a coral color that's very light and wearable. I think this is a great color because it's noticeable that you're wearing color on your lips, but it's not too much color. There aren't really downsides, but I do have to contradict what they claim. It says to stay for 10h. I've eaten and drank with this lip balm and the glossy finish goes away like most lipsticks do. I'd say this will stay on the lips for about 5h. It also says on the crayon to be a lipstick. I think it's more of a crossing of a lip balm and a lip stain. It applies as smooth as a lip balm and after half a day you can still see a hint of color on your lips.